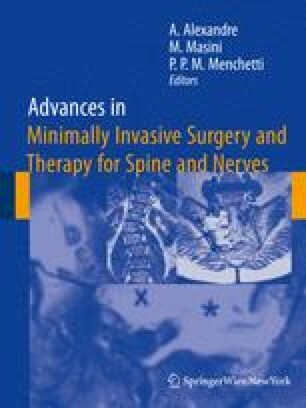 Background: Nucleoplasty appears a successful minimally-invasive treatment for symptomatic contained disc herniation (protrusion). The purpose of this prospective study was to assess the effectiveness of nucleoplasty for alleviating pain and dysfunction in our patients. Method: All patients who presented with established low back and/or leg pain of at least 3 months’ duration were clinically followed for 1 year following the nucleoplasty procedure. Self-reported grading of pain using the Visual Analogue Scale (VAS) and the Roland Morris Disability Questionnaire (RMDQ), and subjective global rating of overall satisfaction were recorded and analysed. Results: Eighty-three patients, aged between 20 and 65 years who were treated with nucleoplasty were included in the study. No complications were noted. At the 12-month-follow-up, the median VAS and RMDQ scores were significantly reduced in the patients who were considered successful (VAS by 6–7 points, RMDQ by 8 points) compared to the patients who were considered failed showing much less reduction. (P = 0.000 in both cases; Mann-Whitney U test.) There was no significant difference in the baseline VAS and RMDQ scores in the two groups. Patients who were considered to have failed the procedure tended to be older. Multi-level disc decompression did not appear to be a risk factor for failure. Conclusions: This disc decompression procedure was a safe and effective treatment option for carefully selected patients affected by low back and leg pain due to contained disc herniation. Conflict of interest statement We declare that we have no conflict of interest. Acknowledgement This study was supported by Kuwait university research grant no. RM 02/06.